Of about 41m², 2 bedrooms, fully equipped, comfortable, functional, comfortable, balcony, self catering accommodation. Located in Ceillac in Queyras on the plateau of the Southern Alps, just 300m from the old alpine village of Ceillac and its shops, the VVF Villages Les Alpages du Queyras ** enjoys an ideal location on the Italian border to leave for the discovery of the natural and cultural wealth of the region. It comprises 73 dwellings connected to the reception pavilion by external passageways. For your leisure, the village has a reading corner, a play area with table tennis, table football and billiards * and outside, a playground for children. Bubble: The perfect place for Buller! Concentrated of what teens love, this place is dedicated to them: sofas to rest, Wifi space to connect, multimedia spaces to play and meet! Created by Teens for Teens! During spring-summer-autumn school holidays: 4 half-days and 1 day of hiking guided by professionals from the mountains. For more tranquility, the village offers various services such as towels and bed linen, household packages * or baby kits (folding bed, high chair, baby bath). It also has a launderette * (with washing machines and tumble dryers), free WiFi access in common areas and free parking. For hiking enthusiasts, enjoy hiking trails, mountain bike trails and hiking trails with breathtaking views of the Queyras and Ubaye mountains, go to the Mirror Lake and take a break at the ice circus of Lake Ste Anne. Want a little more thrills? Paragliding, rafting, cannyoning and climbing to fill up with adrenaline! 3 bedroom duplex apartment of approximately 41m² for 5 people, composed of an equipped kitchenette, a living room with a single bed, a bedroom upstairs with a double bed and a second bedroom with 2 single beds and a bathroom with shower and separate WC. Note: Housing available for rent. 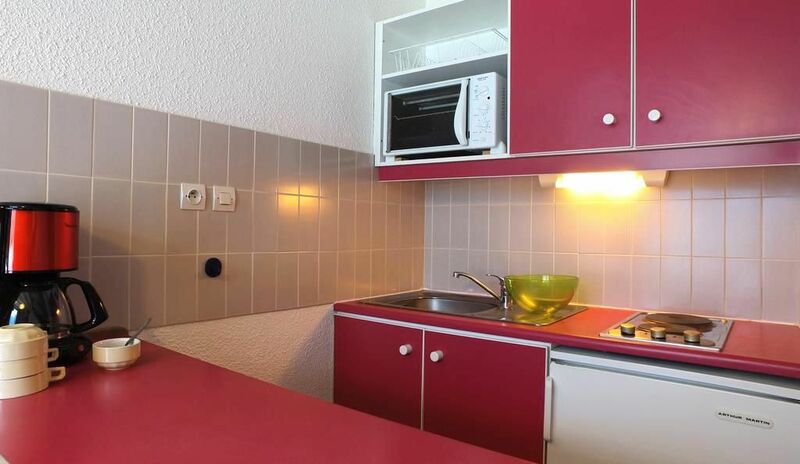 The kitchen area is equipped with a mini oven, kitchenware and fridge. Baby kit: 1 folding bed, bath. Free on request and subject to availability. Laundry: 3. 80 € / wash - 5. 30 € / wash with laundry dose - 2. 20 € / drying. 5. 50 € for a stay of 1 to 2 nights, included in half board and full board. Final cleaning: between 40. 5 and 65. 5 € depending on accommodation. Pack tranquility (beds made + towels + end of stay cleaning): 35 € / person / stay. Daily cleaning and beds redone in pension: 5. 70 € / night. Outdoor parking: free (subject to availability). RN 94 then D902 and D60 via Guillestre. Gare Mont-Dauphin / Guillestre (18 km) then taxi.